Marty makes one of his patented “two-pad stack” saves. These are anxious times for fans of the New Jersey Devils — just ask Riley. Despite coming within two wins of what would have been a stunning Stanley Cup, the Devils entered the offseason with all sorts of questions. Contracts were up for goalie Marty Brodeur, the 40-year-old who is arguably the best ever at his position and unquestionably the icon of the franchise, as well as team captain and the new “face of the franchise,” Zach Parise. There are rumors of financial troubles and missed loan payments, calling into question the team’s ability to retain its stars. All of this is the edgier business side of sports. The side that my livelihood depends on, but not the side to which I want to expose my kids. At 10 and 11, their sports-fan innocence is not yet tainted by things like contract squabbles, performance-enhancing drugs, off-field incidents and labor negotiations. That innocence may get shattered this fall if the NHL and its players can’t come to terms on a new collective bargaining agreement in time to begin the season as scheduled in October. But for now, it remains. A least it did until this weekend. July 1 is free-agency day in the NHL, the day all the players without contracts, including Zach and Marty, can freely negotiate to play for any of the league’s 30 teams. During the Devils’ Cup run, Zach had avoided the topic of his contract, while Marty spoke freely of his desire to play at least one more year. That was music to Riley’s ears. She seized on Marty as her favorite player at her first Devils game and has never wavered. He is, at least in part, the reason she plays goalie in soccer. She has learned all of his records, devoured chapters of his autobiography. She has at times told me she would no longer care about hockey when he retired. Normally, a new contract for a player like Marty would be a foregone conclusion. He has spent his entire career with the Devils. He has never expressed a desire to play elsewhere, and always had a new contract well before reaching free agency. But with so many issues surrounding the franchise, the news this week was not encouraging. He hired an agent for the first time since 1995. He indicated that he would play on, whether or not the Devils offered him a contract. Riley grew more and more worried with each new headline. She was putting on a brave face, but she was holding it all in. Finally, as Veronica was taking her to sib shop on Saturday, she cracked. The tears flowed as she explained how he was her idol for as long as she could remember and that none of her friends could understand why she cared so much and people would make fun of her if they new she cried over him. They are emotions that every young sports fan, at least one as serious is Riley, has to confront at some point. Veronica sympathized and bugged me for news updates. I tried to explain that no matter what happened, it was not Marty’s fault. I told her that her brother certainly understood how she felt. That’s not entirely true. Ryan has an obsessive interest in hockey. He has favorite teams (Sharks, Devils, Caps) and favorite players (San Jose’s Joe Thornton). But he does not have the personal attachment to the players that Riley does. An example — they both have lots of autographs. Riley treasures hers; Ryan casually tosses his aside. In many ways, it makes sense. Ryan struggles to make personal connections, while Riley obviously does not. For Riley, it is all about the personalities. She wants to know the players’ birthdays, their hometowns, the names of their wives and children. Ryan focuses on statistics, and even then it’s almost exclusively team, rather than individual, performance that he cares about. He greeted the possible departures of Zach and Marty with a shrug. No single player would change his love of the sport. As noon came and went Sunday, both players officially became free-agents. Riley retreated to her room, emerging hourly for updates. “Any news?” she’d ask. My negative responses were met with stomped feet, slammed doors, and occasionally tears. I tried to keep her positive. I told her that just because both players had made it to free agency didn’t mean the Devils were out of it. Deep down, I didn’t believe it. I figured both were as good as gone, and I started to think about how I would break the news to Riley without crushing her interest in the sport. I would fight to maintain theone shared interest our family has. Today begins summer camp for both kids and a glorious return to structure. Ryan was nervous, but putting on a brave face. Riley would normally be ecstatic, but she was still saddened by the situation with Marty. 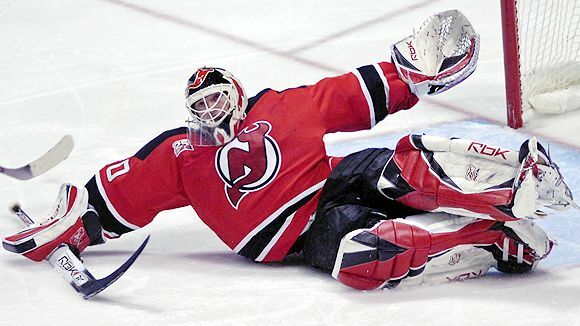 Martin Brodeur is staying with the Devils. 2 years / 9 millions. Great news for the Devils fans and that franchise. I had to explain to Riley that it wasn’t yet official, which was a difficult thing to convey over text message. I finally got her to understand. Okay. Thx. Now I can have fun at camp. And … exhale. Marty should make it official sometime later today. As for Zach? Still up in the air. He is supposed to decide his future today as well. Riley is also sweating that one out, but not nearly to the same level she was with Marty. It would have just killed her to see him skate at the Prudential Center in another team’s uniform. I am thrilled at the family connection we have developed over sports. I love that my daughter is as passionate as she is about the Devils and about Marty. But at the same time, it hurts. It hurts to see either of them get upset at the result of a game. This was even worse, trying to explain the business/financial side of what my kids still view as a game. But as painful as it can be, I wish Ryan had the same level of connection to the players that his sister has. It serves as a reminder of their differences, but also of the miracle that we have somehow found common ground in this sport, no matter how differently they see it. hahaha. . . that’s awesome. How much will you hate the Penguins when they sign Parise? More or less? Well, isn’t 100% the most you can hate something?